Melt (or better yet brown!) a two sticks of butter. Stir in three mushed overripe bananas. Cool a little bit then stir in 1 1/2 cups of milk and a cup of sour cream, then 5 eggs, 1 Tablespoon vanilla and if you have it on hand a dash of orange oil. Then add one cup of brown sugar and one cup of white sugar. Stir liquids and dry ingredients together in whichever bowl is very large. Bake at 425 for about ten minutes (so they rise and get a nice crispy crust), then lower temp to 350 until cooked through. So Philadelphia, the home of my youth and my home again now, has a rich culinary heritage. Pies and chicken and veggies from the Pennsylvania Dutch influence. Breads and salamis and cheeses from the multiple European influences. Soft Pretzels from German immigrants. And of course spectacular pizza, pasta, hoagies and cheesteaks on every block, normally by 2nd or 3rd generation of family ownership with a Greek or Italian surname. What you don't find too often here ... BISCUITS. But I married a man of Southern heritage, South Carolina to be precise, and I decided 2017 would be the year of the biscuit. 1) Self rising flour expires. Of course in most cases if flour is in a Tupperware canister it doesn't really go BAD ... so I didn't worry about how old mine might be. (only later I realized it was probably bought for my mother in law's visit when she made us her spectacular fried chicken ... before my first 1st grader WAS BORN). But that's a lot of words to say that the self rising flour or baking powder should be younger than kindergarten eligible. Attempt number 1 had pretty good flavor but didn't rise AT ALL. Hockey puck, anyone?? 2) When biscuit recipes say to "roll" the dough with a rolling pin they don't mean as thin as gingerbread dough. And yes, it took me TWO pans baked before I realized WHY they weren't tall enough: I was rolling the dough WAY too thin. My husband remembered the dough being TALLER than the biscuit cutter back when his mom made homemade biscuits ... AH HA! Attempt 2.1: flaky, some rise, too short. So I still had half the dough and made it much much taller when I rolled it. These ones were good! 3) hexagon biscuit cutters are great! <<< see how the hexagon cutters leave no waste between biscuits? Mix into flour/butter mixture, again a few quick pulses. Let dough sit covered in a cool kitchen (my back section is in the 50s during winter) or in fridge for about 1/2 hour. Set oven to 400 degrees. Liberally sprinkle a clean dry counter (cool stone is great for this), then sprinkle top with flour and flour your hands and flour your rolling pin and flour the floor (ok, that part is optional, but I always do!). Gently/quickly/barely roll out the dough - but this isn't cookies, so it should still be quite thick! Use a straight sided drinking glass or biscuit cutter to cut biscuits, place them on pan an ungreased sheet pan. Bake 12-14 minutes. 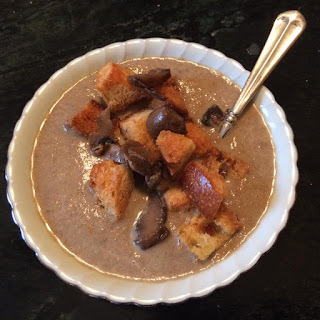 My husband asked recently about a mushroom soup, so when I was at the grocery store recently I picked up a big package each of sliced baby portabellas and sliced white button mushrooms. This their story. 1st, starting yesterday, roast a chicken and make stock overnight from the bones. WHAT? You didn't want to roast a chicken just to make mushroom soup? Ok. In that case you'll need about 1.5 quarts of chicken or veggie broth. Rinse the mushrooms well, while your soup pot or dutch oven heats with a turn of olive oil. Add the mushrooms, cover and let them cook down. Stir once in a while. Meanwhile crush up a good handful of a more flavorful dried mushroom into some hot stock. I had dried porcinis on hand, but there are lots of different ones available. 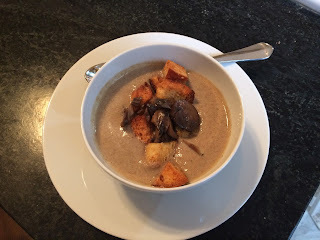 Once the mushrooms are cooked, pull out a cup or so into a bowl (for garnish) and in the pot with the remaining mushrooms add about 1 1/2 quarts of chicken broth, some dried onion (or sautee a chopped fresh one), some garlic powder, thyme, ground black pepper, nutmeg and about a cup of white wine. A dash or two of Worcestershire sauce is good too. Let it all simmer for 30-60 minutes. Serve garnished with croutons and the reserved mushrooms. Goat cheese (chevre), more cream, cream fraiche, bread crumbs ... all other good garnish choices!